Prohibition began in Georgia on January 1, 1908. In the absence of alcohol, the crime rate in Atlanta plummeted, leaving the police bored and restless. Some officers contemplated leaving the force and becoming butchers or streetcar conductors instead. The police saw the same light on the following Saturday night, so on the third Saturday of the month, after eighteen slow days, one of the officers took the initiative to stay and watch the building. Around 8:00 PM, young men began arriving street cars and going in the building. It was a rough looking group, he thought. The officer shadowed them, trying to stay out of sight, and saw them piling into the elevator. He climbed the stairs in time to watch one of the young men arriving at the door of their seventh floor room. The young man knocked on the door and was answered by a knock from within. He then mumbled something indistinct, but roughly “Anhauseurpilsneretschiltz”, which the officer interpreted as a list of beer brands. He waited in the warm, steam heated hallway for hours, watching and listening, concluding that it must be a club for illegal drinking and gambling. The officer reported back to his station house. His captain took an interest and the following Saturday night, January 25th, the captain and four officers, all dressed in civilian clothes and disguising their appearance with false whiskers, went to the Peters Building to conduct a raid. The captain envisioned receiving praise from Chief Jennings or even the formidable judge of the police court, City Recorder Nash Broyles. Hiding inside the building, the police waited until 9:00 PM. Two husky young men, arriving late, led two others to the room where the main group had been for an hour already. The officers decided that it was time to make their move. One guarded the elevator, another the stair way, while three of them listened at the door, hearing stomping and occasional shouts within. Undoubtedly, they decided, unbridled drunken revelry lay within. The captain signaled his men to get into position, then knocked in imitation of the manner used by the previous entrants. The doorkeeper opened the door a crack and asked what was wanted. He was startled when, by way of response, the captain stuck his size 13 shoe in the crack and shoved. It was Clayton Buchanan, a freshman at Georgia Tech, who had the duty of guarding the hall door of the outer room of the weekly Alpha Tau Omega chapter meeting that week. When the police captain thrust the door open and five billy clubs were waved under his nose, he simply grabbed the captain, swung him by the seat of his pants, and threw him into a half-empty box across the hall. The noise interrupted the initiation, or at least the preparatory hazing, of the two pledges who had just been brought before the chapter. Twenty of Clayton’s fraternity brothers, led by varsity football player Cherry Emerson, came rushing out of the inner room. Seeing the five intruders, who were automatically assumed to be after fraternity secrets, they attacked. The police struck valiantly with their clubs, but were no match for the youth, numbers, or fury of the students, some of whom favored throwing them out the window and letting them fall eighty feet to the street. 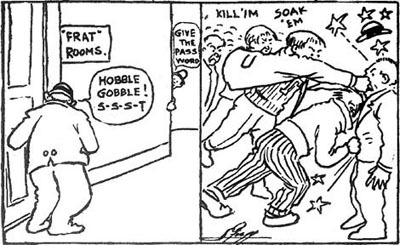 The Atlanta Constitution’s staff cartoonist, Louis Gregg, provided this interpretation of events for the January 29, 1908 issue. But in the middle of the fight, a young alumnus who worked downtown recognized one of the officers through his disguise and called for everyone to stop. He announced, “Fellows, these are not interlopers or eavesdroppers, but policemen.” One of the brothers, the “T” on his sweater quivering, cursed and asked, in that case, what they were busting in for. The policemen stumbled through a general explanation of their suspicions. The alumnus then tried to explain to the officers, none of whom had ever been to college, the nature of a college fraternity. They met on Saturday nights, like all fraternities, because that was the only time student regulations would allow them out on the town. They met in the manner that they did because they were a secret society, like the Masons and other lodges popular outside of college. And they met downtown because there were no suitable rooms out on the edge of the city where Georgia Tech was located. Many fraternities rented rooms in office buildings; one in the Austell Building, another in the Empire, a third in the Equitable. No drinking went on at the meetings, not even of popular medicinal liquor substitutes like Listerine and Jamaica Ginger. 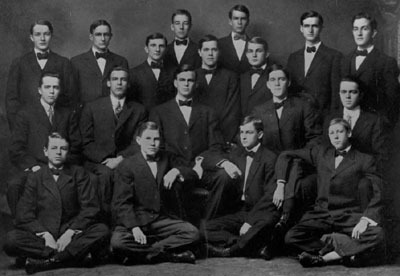 The members of Alpha Tau Omega as depicted in the 1908 Georgia Tech Blue Print. Cherry Emerson is fourth from the left on the second row.